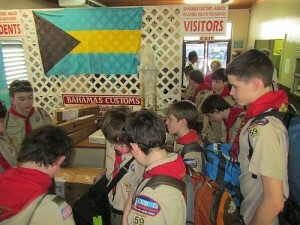 Leader, Crew, & Parent’s GuideWe make it simple and easy to get your whole crew ready and organized for this trip!! Ciganka Charter Check List: Each crew member must print this out and check off each item. When each item is checked off, you are ready for your high adventure sailing trip on Ciganka. Leader, Crew, & Parent’s Guide: Every parent needs to read this. It will answer many questions they may have. Documents Needed for Your Travels—You must have a valid passport. And if you are under 18 years old are not traveling with both parents you must fill out and carry the Minor Travel Authorization Letter form. You will give this form to the Bahamian Immigration Official. Health & Medical Form, Liability Form and Minor Travel Authorization Letter: Every participant must have these forms completed and carry them to the Bahamas. 24” Duffel Bag: All your gear must fit in a 24″ duffel bag. No suitcases or frame backpacks can be used. You can have your sleeping gear tied to the top of your duffel bag or one separate bag with all the sleeping gear in it. You will be living on a sailing vessel during the entire adventure. Space is limited so you must only bring what you need. There is no storage available on land for your crew. All belongings will have to go with you on the vessel. Keep this in mind and travel light! Packing List: Follow this packing list exactly and you will have everything you need for your week on board. Print this out and check off each item as you pack. Food and Travel Information Must be filled out at least 1 month prior to your charter. 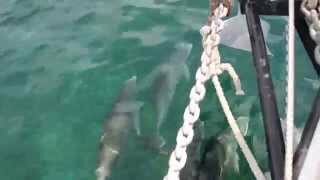 A pod of dolphins playing at the bow of the boat!